On April 1, 2017 Qredits started its microfinance activities on Aruba. As of today any (starting) entrepreneur or existing business on Aruba can apply for microcredit up to Afl. 50,000 through the website www.qredits.com. Tuesday April 4 at 16h the Qredits Aruba office will be officially opened in the MFA Noord building in Noord Aruba. Prime Minister Mike Eman will also be attending the opening. 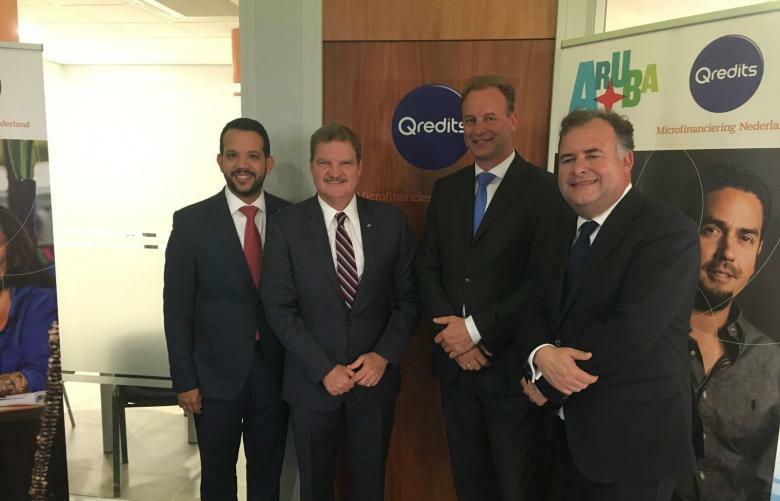 Last March 21 Qredits CEO Elwin Groenevelt and Prime Minister Mike Eman already signed a cooperation agreement enabling Qredits to start up operations on Aruba. Qredits mission is to strengthen entrepreneurship on Aruba by offering small business loans up to Afl. 50,000 to (starting) entrepreneurs as well as mentoring. Qredits anticipates issuing around 100 loans during 2017/2018 with an average amount of Afl. 30,000 each and coach at least 200 aspiring entrepreneurs in setting up their own business. Plans are to also offer the educational program Ik word EigenBaas (Be your own boss) to approx. 250 local students. Besides that the e-learning course How to write a business plan is available in Dutch, English, Spanish and Papiamento and will be offered to entrepreneurs through a redeemable voucher available at Qredits and the Chamber of Commerce. The Qredits team, located in the MFA Noord building on Aruba, will consist of two local commercial lending advisors who will be screening the business plans and loan applications. Oliver Vieira is the branch manager who has many years of experience in commercial banking and a strong affinity with entrepreneurship. Qredits is still actively looking for a second commercial lending advisor. As of today the Qredits Aruba website is live and can be found at www.qredits.com. The website is available in four languages (Dutch, English, Spanish and Papiamanto). Loan applications can be made online through the website and all necessary accompanying documents can be uploaded. According to Elwin Groenevelt, Qredits CEO: “This branche on Aruba signifies the next step in creating opportunities for all entrepreneurs throughout the Caribbean Netherlands to be able to start or expand their own business. Following the success of Qredits Bonaire our Aruba operations provide a great opportunity to show that our approach is successful!”.